New York : Thompson & Moreau, 1881. Reprint : The American Monthly Microscopical Journal, August, 1881. Description :  - 4 p. ; ill., 1 pl. , 23 cm. Photograph : Heliotype, 4 photomicrographs on 1 leaf. Subject : Bacteriology, B. Anthrax. 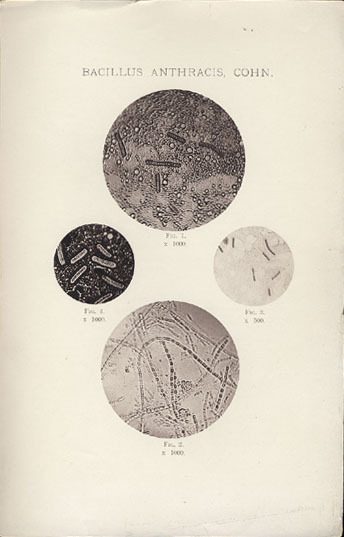 The researches of Davaine, Koch, Cohn, Pasteur, Greenfield and others seem to me quite conclusive as to the intimate and essential relation of the 'Bacillus" to the etiology of anthrax, and further confirmation scarcely seems necessary. Moreover, my time is fully occupied by other experimental researches. I shall take this opportunity however for making a few remarks upon the staining of bacteria for the purpose of making photo-micrographs of them. Fig. 1, from liver of mouse, stained with anilin violet (ink). Fig. 2, from culture in chicken-bouillon, stained with iodine solution (5 per cent. ), without the use of sulphuric acid. Fig. 3, from liver of mouse, stained with anilin brown. Fig. 4, from liver of mouse, stained with iodine solution. The amplification is 1,000 diameters in Figs. 1, 2 and 4, and 500 diameters in Fig. 3. Fig. 1 was made with Zeiss' 1/18-inch homogeneous oil-immersion objective and Tolles' amplifier ; Figs. 2, 3 and 4 with the 1/12 inch homogeneous immersion of Zeiss.